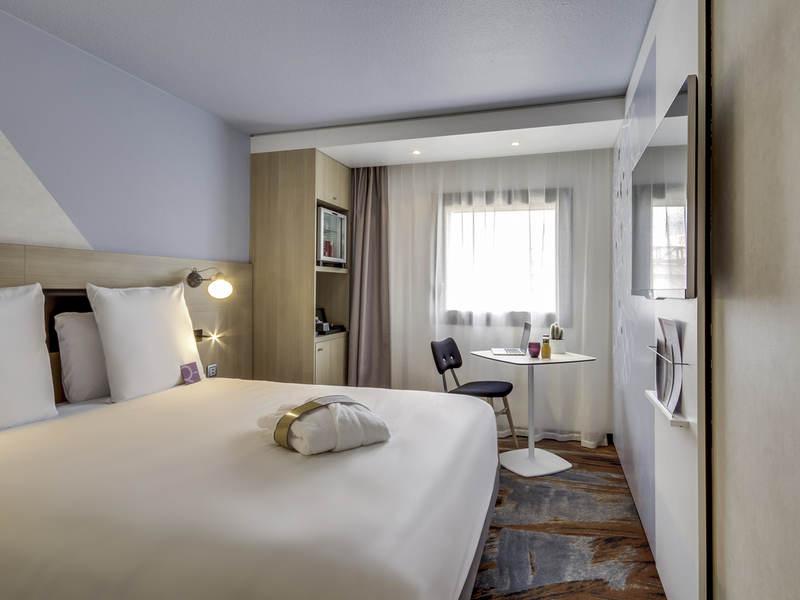 Looking for a restful night's sleep before visiting the City of Light, working in peace, grabbing a bite to eat with colleagues or enjoying a quick drink before catching the train? Welcome home! Located at the foot of Gare de Lyon's clock tower, Mercure Paris Gare de Lyon is ideal for business guests with its four meeting rooms and coworking space. With a decor drawing inspiration from street art, our Paris hotel invites you to sleep soundly in our top-of-the-range beds, work out in our fitness room or relax in our bar. Discover all the classic Parisian products and brands, such as Le Baigneur soaps and La Parisienne beer, in our boutique. Our location right next to the Gare de Lyon gives you access to so many forms of transportation for exploring the city. The RER A provides direct access to the Arc de Triomphe, La Défense and Disneyland Paris, while metro line 1 takes you to Notre Dame Cathedral, the Louvre Museum and the Champs-Élysées. Closer to the hotel are numerous beautiful places for walks, such as the Jardin des Plantes, the Port de l'Arsenal and the Coulée Verte. Take in a show at AccorHotels Arena, only a 20-minute walk away. Discover the new AccorHotels Arena in Bercy. With numerous events planned each season, the AccorHotels Arena is on the map for international tours and major sporting competitions in Paris. Very central location: Gare de Lyon, AccorHotels Arena, Bastille, Le Marais, and much more. Parisian transport hub with direct access to your favorite spots: Louvre, Disneyland, etc. A Made in France bed that you'll never want to leave! For more comfort, choose our Privilege Room, which provides exclusive upscale Mercure bedding with memory foam mattress toppers and pillows, bathrobe and slippers, Nespresso machine, free WIFI and minibar and much more! You will also love our room service, which offers a range of quality hot and cold dishes. Enjoy a moment of relaxation in our new fitness area. Visit the Rendez-vous to relax and sample our delicious new Grignot Chic menu and our Grands Vins Mercure. EasyWork workspace for 2 to 6 people with WIFI, tea and coffee making facilities, Nespresso, printer, etc. Hotel was clean and had many accommodations. Appreciated English speaking attendants at front desk who’s recommendations made touring easy. Super location with access to train, taxi, restaurants, etc. Would stay here again. I forgot some sport clothes in my room that I realized when I arrived home. I phoned twice at the hotel but in both cases they told me they didn't find anything at the room. Checkin: 9th April Checkout: 10th april Room: 239 I hope these clothes are foud, because I can collect them next month due to I'll be another time on business triple. Dear Yves-Ehlert-SP, Thank you for your kind feedback. We are happy that you enjoy our renovated room and our new pop art breakfast. When renovating our rooms we changed our bedding and we are glad you enjoyed it. We will forward your comment to our clening service. Please rest assured that we are taking the appropriate measures to address the problem and prevent future occurrence. Thank you again for sharing your experience, and we hope your next visit will be as pleasant as the previous one. Le Mercure Paris Gare de Lyon TGV. The bathroom sink did not empty. I made a remark to the front desk clerk, who thanked me for my remark. Hotel right next door to the Gare de Lyon and therefore convenient for catching a train after a good night's sleep. Large number of good restaurants nearby for dinner. We booked an overnight stay because our Eurostar had been cancelled. We have stayed at this hotel before when travelling by train. It’s right next to the Gard du Lyons and close to the river. Excellent location. It’s spotlessly clean with decent sized rooms. The staff are excellent. Incredibly helpful in printing off our revised Eurostar tickets. And when there was some noise from outside due to an impromptu gathering of youngsters with music, they called the police and immediately gave us a change of room. Extensive choice for breakfast. Left luggage very efficient whilst we went out. Could not fault the hotel, we were very pleased with it. Dear Nic D, Thank you for your comment. We are happy that our hotel has made your travels easier. When renovating our rooms we changed our insulation and we are glad you noticed it. We are very happy to have welcomed you to our hotel and we hope to see you soon. Le Mercure Paris Gare de Lyon TGV. Up to usual standard. At front but no noise. Many STUPID easily fixed problems. We have always stayed at this hotel when we need to get the early train and have always been happy with our experience. Nice rooms & friendly staff. I received a very warm and efficient welcome, and my room was very comfortable and warm. The breakfast was well appointed with everything easy to find and tasty. The check-out on my departure was efficient and fast - a very well run hotel. very comfortable,perfect location for onward travel,easy to walk to major sights. I liked very much the location of the hotel. The stuff working was really friendly and helpful. The rooms weren't really clean and comfortable, and for the price I found the rooms small. The quality of the breakfast was good, and the facilities also. Good check in, clean comfortable room. very pleasant stay. Just one point was that I was disappointed that there wasn't any 'normal' tea and milk in the room. When I went down to reception I was told that there wasn't any milk but I could try the bar. Helpful staff at bar gave me some milk. Maybe you could consider offering plain milk in the rooms rather than just sugared cream. My husband and are were only staying one night but great location for Gare De Lyon. Nice area. Good restaurants nearby. Room lovely. My only comment is that there wasn't any 'normal' tea in the room (a brit thing!). Also there was only cream with sugar ugh! when I asked at reception for some milk was told didn't have any but I could try the bar! Thankfully they had some. Dear Jeanet and David, Thank you again your comments regarding your stay at the Hôtel Mercure Paris Gare de Lyon TGV. Your comments have been noted. Please rest assured that we are taking the appropriate measures to address the problem and prevent future occurrence. Thank you again for sharing your experience, and we hope your next visit will be as pleasant as the previous one. Sincerely, Le Mercure Paris Gare de Lyon TGV.